Over the last two weeks, I introduced Salvatore, and shared some of his experience during World War II. After hearing about the priest, we threaded our way through the streets of Piedimonte Matese, impressed at the pace Salvatore set for us, given he was older than we were by thirty years or more. As he was unlocking the door to his house, I noticed a piece of ancient history built right into the door frame. The lower two or three feet on the left hand door frame was made of a fluted stone column, broken off at an angle. The typical Italian house construction, thick walls with stucco finish, surrounded it. I don’t recall asking what his father was doing when he found it. Fishing, maybe? I’ll bet you’ve never gone fishing and found an ancient Roman marble column! I found a silver dime once when I was digging in the garden, but that marble column has it beat. It must have been found before modern antiquities laws were enacted in Italy, because items like that are no longer considered ‘yours for the taking’ even if found on your own property. We entered a corridor and climbed to the second floor balcony to enter his home. (This is called the first floor in Italy, being the first floor above the ground floor.) It was cool and spacious, with dark furniture and nicely framed paintings. Light filtered in from a courtyard filled with plants. Salvatore introduced us to his wife, who spoke no English. She greeted us kindly, with a knowing resignation that led us to believe we were not the first strangers her husband had brought home for a visit. 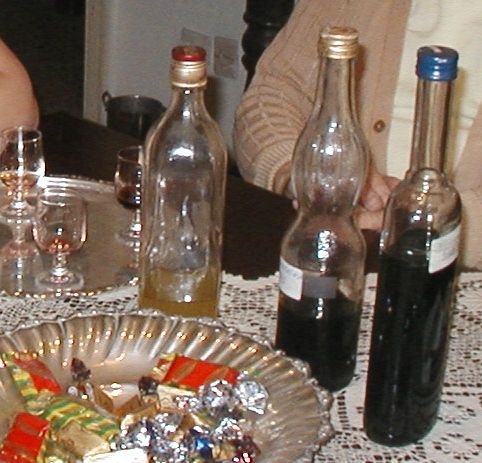 After a short time she brought a silver tray with small glasses, and three bottles of liqueur with hand-written labels taped to them. After that, she left us to visit, and we didn’t see her again except to say goodbye. Salvatore told us about his sons. One had followed him into the teaching profession, and the other was handicapped in some way, and required special care. “Please try the drinks I made,” he urged us, and poured dark liquid from a tall bottle. “It is made from hazelnuts,” he said of the first one. A small taste was enough of that. Next came cherry liqueur, burning a deep red path down our throats. Salvatore set that aside, clearly eager to get to his last offering. “I make this from my own recipe. It’s like limoncello,” he said. We knew limoncello, and enjoyed it, but his drink was more orange colored than any we had tried. And more delicious! He smiled with satisfaction at our response. “It has not only lemons. 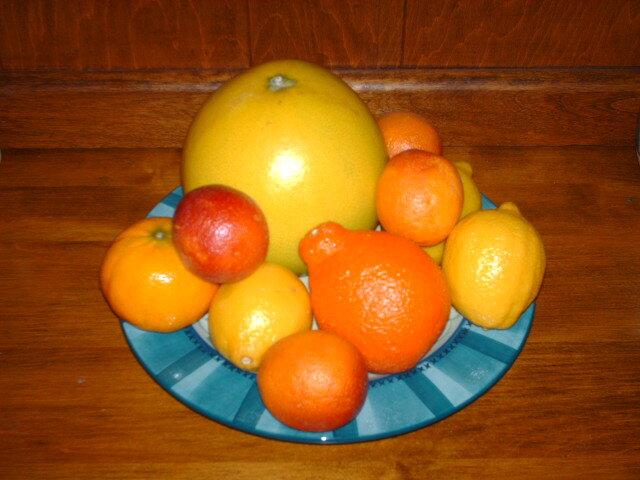 I make it with oranges, lemons, and tangerines. My own recipe.” He beamed as we sipped the golden nectar. “I grow the fruit right here,” he said, gesturing toward the verdant courtyard. As he went to get paper and pen, I thought to myself, of course he shares his recipe. He is a man who shares his whole life, openhanded and openhearted with friends and strangers alike. He scratched out the recipe, with careful instructions, and we visited some more, went out on the balcony to see the garden, looked at paintings on his walls and photos of his sons. As the afternoon wore away, we reluctantly excused ourselves to go back to the hotel. Our heads swirled with the stories, but more than that—Salvatore’s life itself was vibrant with generosity, joy, patience. More than eight years later we still think of him and marvel. Who would have thought that the strongest image of life we encountered in Italy was an elderly, nearly toothless man who earned his living teaching a ‘dead’ language? Salvatore—that name means ‘savior’ and Salvatore’s spirit of vibrant life seems just what the world needs. Someone willing to do good in the face of ridicule, to foster young lives (human as well as plants), to remember the past and look to the future, and to share generously with strangers. Maybe you are as eager to have Salvatore’s limoncello recipe as I was. I’m sharing it here, just as he wrote it for us. This entry was posted in Food, Travel and tagged food, Italy, limoncello, Piedimonte Matese, Salvatore, travel. Bookmark the permalink. What a great story Sandy, thank you for sharing Salvatore with all of us! I’m glad you liked it! Looking forward to more Italian adventures in August. I love this story! I didn’t like so much waiting for the end :) And I like the recipe, too, but I like cream limoncello more. When you make liquor like that, the longer you wait to drink it the better it gets! I’m glad you liked it, Marlie. It seemed pretty long for one post, but I guess I could have made it just two. And I think this recipe could be made as a cream version. Yum! Creamsicle Liqueur. Really sweet story! Thanks so much for sharing!